I am back with another recipe post. This one's from my MIL's kitchen and you will be surprised by how easy it is to make and how yummy it tastes. The main ingredient of this recipe is the white portion of the watermelon which is left on its skin after you have sliced off the edible part of the melon. 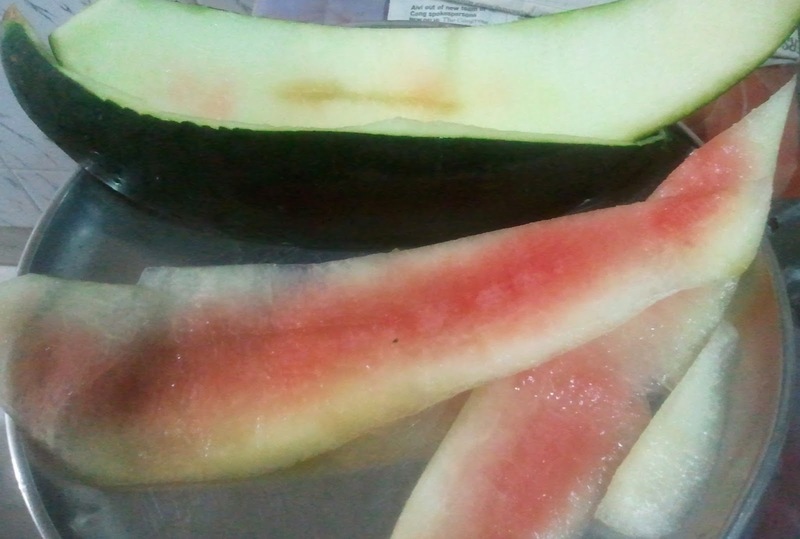 Slice off that portion of the melon that you generally throw away and dice it. In a non-stick pan, add some oil and just when it gets heated up, add curry leaves, cumin seeds, brown mustard seeds, a pinch of asafoetida and a tsp of turmeric. Now add the diced watermelon portion, tamarind (just a little as per your taste), all the spices and salt and sugar as per your taste. Pour in a cup of water and let it simmer for 10 mins. Tada..your Watermelon Sabji is ready to be relished. Tastes best with Rotis. OMG!! really simple but looks yummy!! have to give this a try!! Hey Mandy this is super easy n super yummy...u shud try it. Let me know ho wit turned out. Wow.Dint know watermelon can be used this way. I know..i was surprised too. I am so keen to try it. this is interesting and quite unheard of,and looks delicious too ! Wow! Didnt know you could make sabji from watermelon! But it looks mouth watering .. slurp!